It lies in North Shropshire, north of Shrewsbury. The village has a population of 2,503 as of the 2011 census. The village has strong links to Shrewsbury to the south-east, Oswestry to the north-west, and Wem to the north-east. 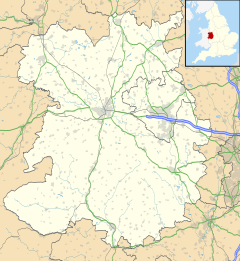 There is a large village not far west of Baschurch called Ruyton-XI-Towns. Eglwysseu bassa y orffowys heno. Eglwysseu bassa ynt ffaeth heno. rud ynt wy rwy vy hiraeth. Eglwysseu bassa ynt yng heno. Eglwysseu bassa ynt tirion heno. rud ynt wy. rwy vyng callon. Eglwysseu bassa collassant eu breint. gwedy y diua o loegyrwys. Eglwysseu bassa ynt diua heno. gwyr a wyr a mi yma. Eglwysseu bassa ynt varuar heno. rud ynt wy rwy vyg galar. the support in battle, the heart of the men of Argoed. It is reddened; too great is my sorrow. it is the land of the grave of Cynddylan Wyn. It is reddened; too much is my emotion. of Cynddylan and Elfan Powys. its warriors are no more. Men know and me here. It is reddened; too great is my grief. The English name Baschurch first appears in the Domesday Book of 1086 as Bascherche, and both names may derive from an Anglo-Saxon personal name Bass(a). Thus the name in Canu Heledd is a Brittonic version of an English name. Local tradition holds that the Berth Pool and its ancient earthworks outside the village are the resting place of the legendary King Arthur. In medieval times, several properties in the parish, including Adcote Mill, were owned by Haughmond Abbey near Shrewsbury. The world's first orthopaedic hospital was established at Florence House in Baschurch by Sir Robert Jones and Dame Agnes Hunt in 1900 as a convalescent home for crippled children and later to treat wounded from the First World War. The hospital moved to Oswestry in the 1921. In 2000 a large stone made of local sandstone was erected in the modern centre of the village to commemorate the Millennium. Similar smaller stones were erected in neighbouring communities. A major feature of the village is All Saints' Church (Church of England) which is one of the oldest standing structures in the village (perhaps the oldest). A timber church which burnt down is believed to have stood on the same site previously. Leading industrialist and builder Thomas Telford made numerous major alterations to the modern sandstone church. The village also had a Methodist chapel which was built in 1873 and closed in 2014 after the congregation had "dwindled to less than a dozen". It was sold for conversion into a house in April 2015. Baschurch is twinned with the town of Giat in the French département of Puy-de-Dôme, in the Auvergne région. The village has two schools including Baschurch Church of England Primary School, and the Corbet School formerly known as Baschurch Secondary Modern School. Just outside the village is Walford College, an agricultural and sports college which in 2002 merged with Oswestry-based North Shropshire College to form Walford and North Shropshire College. The Shrewsbury to Chester Line passes through the village, though the Victorian railway station was closed in 1960. On 13 February 1961 a passenger train travelling from Shrewsbury to Chester collided with a goods train which was partially shunted into a siding in Baschurch. Three people died in the accident. Television footage of the wreckage is available from the BBC. There have been repeated efforts to bring the railway station back into use, most recently in autumn 2008, with the support of Baschurch Parish Council and the Shrewsbury-Chester Rail Users' Association. In September 2009, a public meeting organised by the Baschurch Station Group, was attended by 250 local people and received extensive media coverage. Dame Agnes Hunt DBE RRC (1866 – 1948 in Baschurch) a British nurse, recognised as the first orthopaedic nurse. Baschurch was one of just six places in the United Kingdom to succeed in a competition held by BT to get super-fast broadband. The winners of the "Race to Infinity" competition were announced on 6 January 2011 and Baschurch came sixth. BT originally promised that only the top 5 places would go through with the upgrade (involving optic fibre-based infrastructure), but were impressed enough by the response in Baschurch. As of March 2018 much of the village has yet to be connected to super-fast broadband. ^ "Civil Parish population 2011". Retrieved 22 November 2015. ^ Williams, Ifor, Canu Llywarch Hen University of Wales Press 1978. ^ Jenny Rowland, Early Welsh Saga Poetry: A Study and Edition of the ‘Englynion’ (Cambridge: Brewer, 1990), p. 389 for dating, pp. 435-36 for edition, p. 487 for translation [stanzas 45-51]. ^ Jenny Rowland, Early Welsh Saga Poetry: A Study and Edition of the ‘Englynion’ (Cambridge: Brewer, 1990), p. 591. ^ Rees, Una, editor, The Cartulary of Haughmond Abbey Shropshire Archaeological Society & University of Wales Press 1985. ^ "New lease of life ahead for Methodist chapel". Shropshire Star. 30 March 2015. p. 5. ^ "Church will become home after congregation drops". Shropshire Star. 21 April 2015. p. 5. ^ Writtle, Joanne (2009). "Villagers' plea to reopen station". BBC Midlands Today. ^ Garvin, Jo (2009). "New life for railway station?". BBC News, Shropshire. Wikimedia Commons has media related to Baschurch. This page was last edited on 23 January 2019, at 20:30 (UTC).